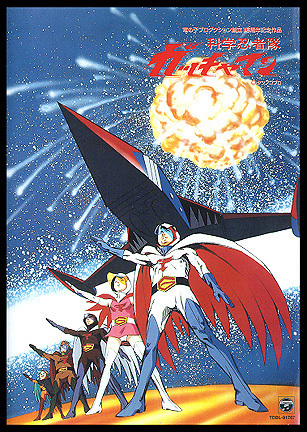 Description: It took over eighteen years, but Tatsunoko finally saw fit to release the Gatchaman feature again after its sole earlier release on VHD. Unfortunately for casual fans, the only way to get it was to have purchased all of the individually released Gatchaman DVDs, or the Gatchaman Complete DVD Box. It was only offered as a mail-in buying premium connected with those two items. Each time, the disc was limited to 1,000 copies. So there were a mere 2,000 copies available. The releases were not serial numbered. The good news was that the majority of the film was immaculate looking - even better than the episodes looked on their DVDs. There was only one real glitch, a spot of film that went to a green tint for about four seconds. But aside from that, it was a remarkably nice looking and sounding transfer. As with all previous releases, there were no Japanese subtitles or closed-captioning. Chapter markers were included on the disc, but only appeared to be present at the reel changes, they didn't place them according to what was going on in the storyline. When it was issued as the bonus for the individual DVDs, it came in a white DVD case that was not consistent with the rest of those releases that came in CD case-like jewel cases. When it was offered with the Complete DVD Box, there wasn't enough room to fit it in the slipcase with the rest of the volumes. Two examples of bad planning, as it would have been nice to keep this special disc stored comfortably with the others.